In January 2015, University of Missouri students on their alternative winter break planted 29 acres of longleaf pine seedlings in old farm fields north of the nature center driveway. 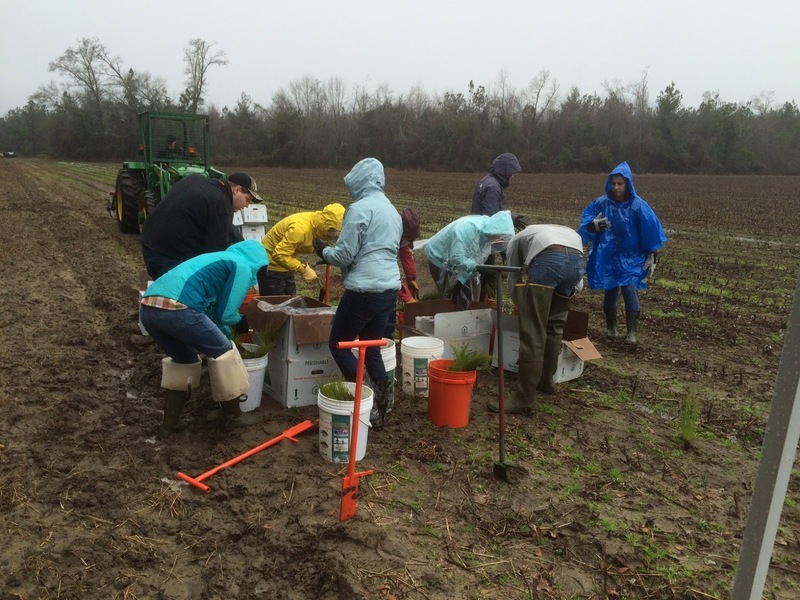 For South Carolinians, the weather was uncomfortably cold (50sF) and wet, but for the students it was a warm contrast to their campus. 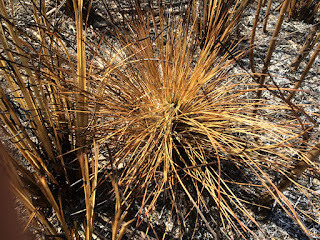 Step #1 for planting longleaf pine: Using dibbles (orange tools), students would open a wedge-shaped hole in the earth, drop a longleaf pine seedling into the hole, and then used the dibble to close the hole around the seedling. To complete the job, repeat step #1 thousands of times. 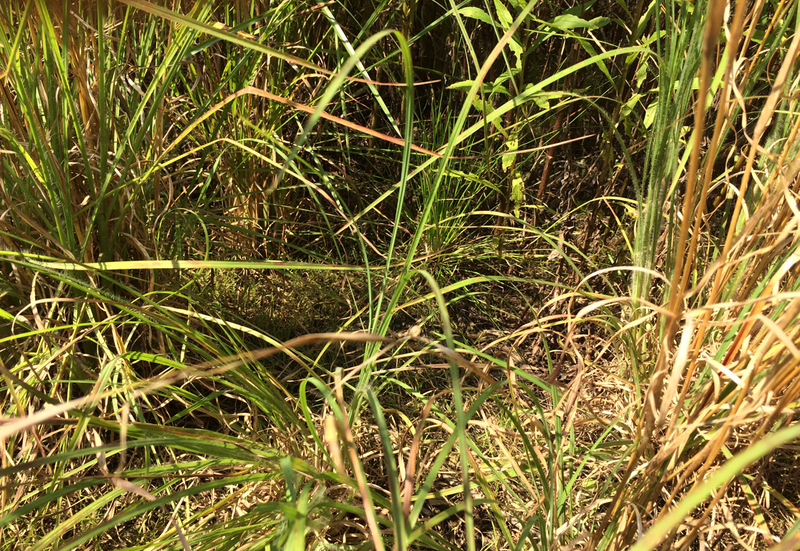 As our volunteer workforce was with us in January, we did not have the luxury of applying herbicide to the spring vegetation when it emerged and then repeating the herbicide treatment in the fall for the later emerging vegetation. 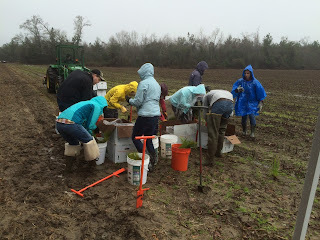 Therefore, we had plenty of pioneering plants become established during the intervening year. 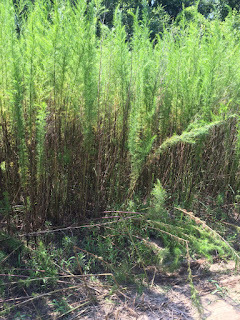 Dog fennel (Eupatorium capillifolium) was the most prolific. 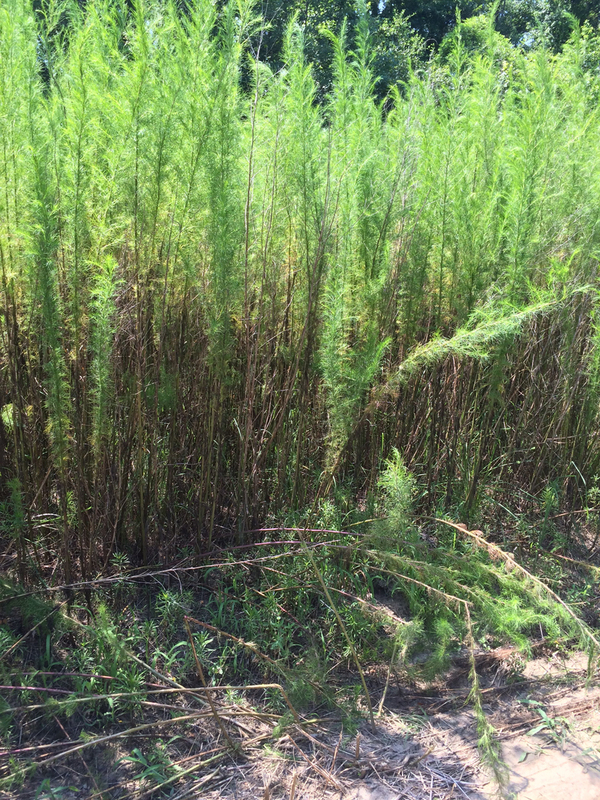 The dog fennel made it difficult for us to move through the tract. 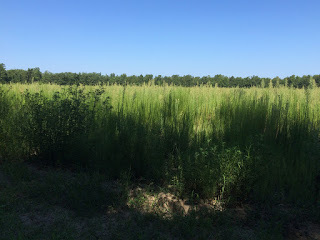 However, rabbits, rodents, and a wide-variety of birds--including wild turkey, painted bunting, blue grosbeak, summer tanager, indigo bunting, Mississippi kites, and swallow-tailed kites--found ample forage and shelter within and above the fennel thicket. 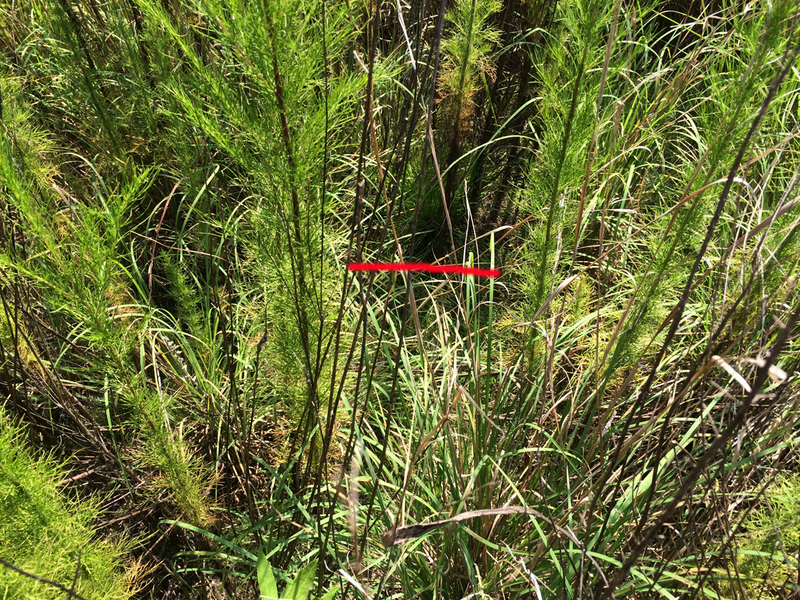 A longleaf pine is practically hidden in grasses and dog fennel (above the red line in the image below). 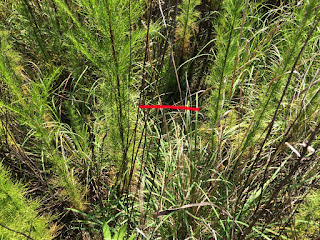 Though the dog fennel seemed to form a thicket dense enough to block sunlight from reaching the ground, sufficient light reached the seedling longleaf pines to allow them to survive. 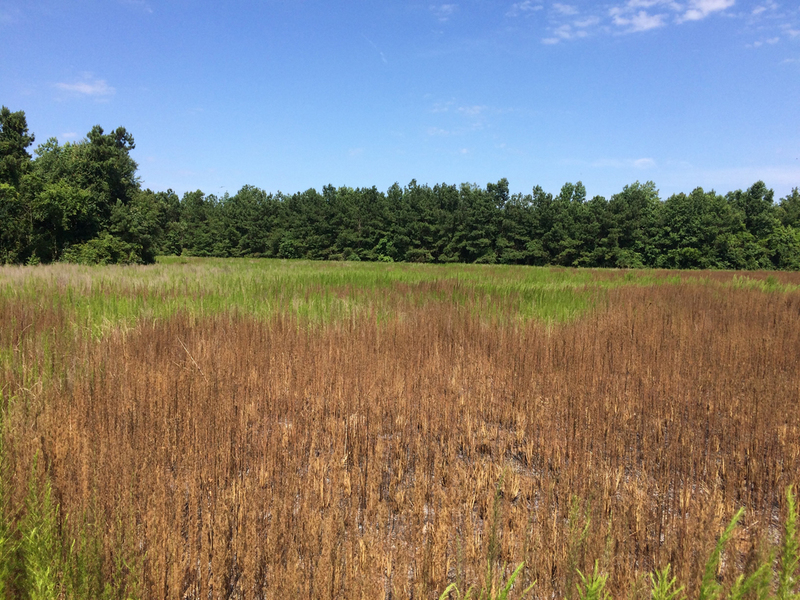 However, to grow out of the grass stage, the longleaf pines would need more direct sunlight. Bring on the fire! 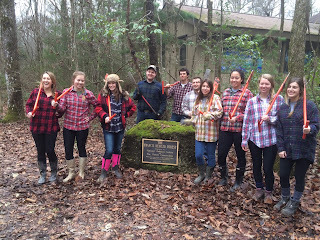 Our opportunity to light a prescribed fire came when a cold front dipped down from the northeast a week ago. If you were in the area, you will certainly remember the severe thunderstorms that accompanied that cold front, including tornadoes to our north. Cold, in this case, was relative. The high temperature two days after the storm was only to reach 83F and winds were forecast to be 15 mph from the northeast. 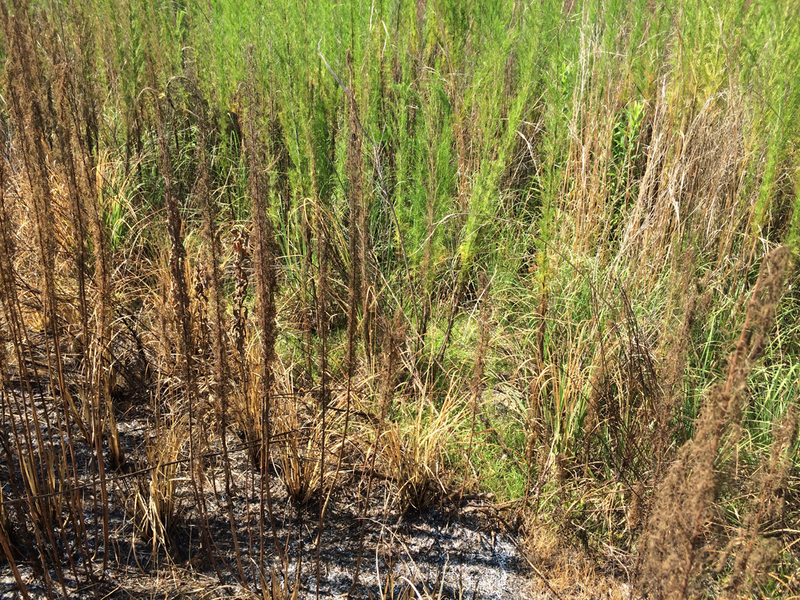 This week's fire was the first for this longleaf pine stand. The six prescribed fire volunteers arrived on schedule, but the winds did not. 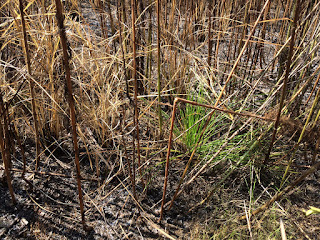 After several failed attempts to ignite the smaller of the two longleaf pine fields, we moved to the larger, less sheltered field where even a slight wind might have a chance to push fire through the dog fennel and grasses. 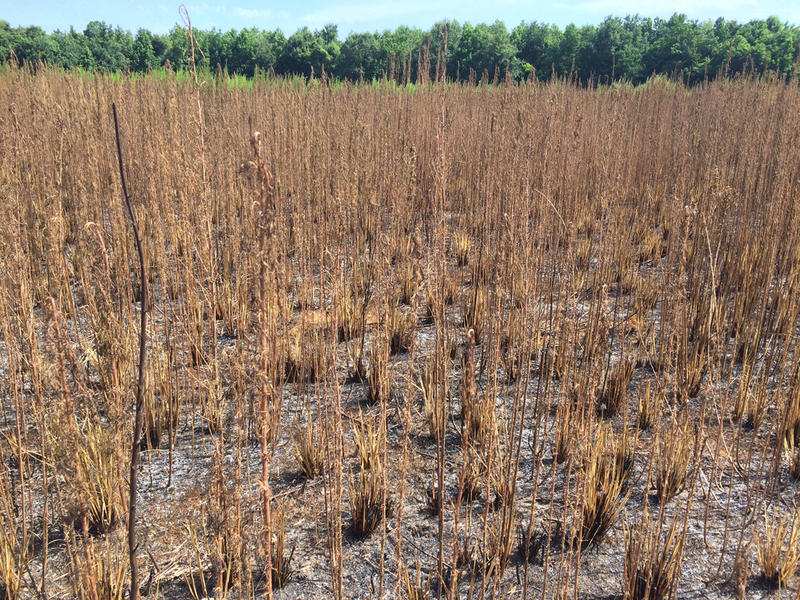 In some areas, the fire was 100% effective in consuming the fuels at ground level, killing loblolly pine and sweet gum seedlings, and wilting or consuming dog fennel. 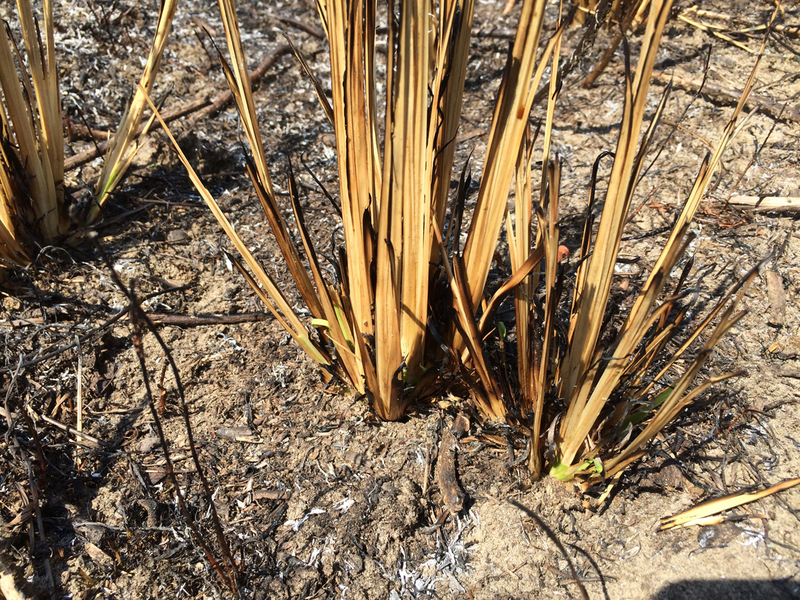 Overall, approximately 60% of the field burned leaving refugia (unburned green areas) for wildlife to use until new vegetation emerges. 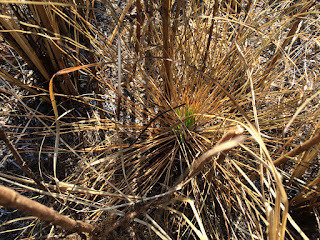 Grasses began showing new growth after only two days. 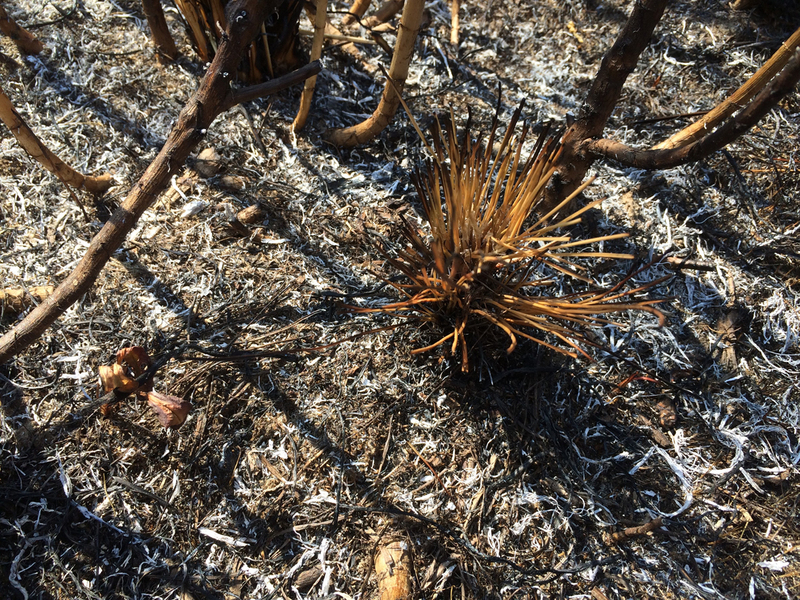 New vegetative growth is more palatable to wildlife, which is yet another reason for periodic fire. 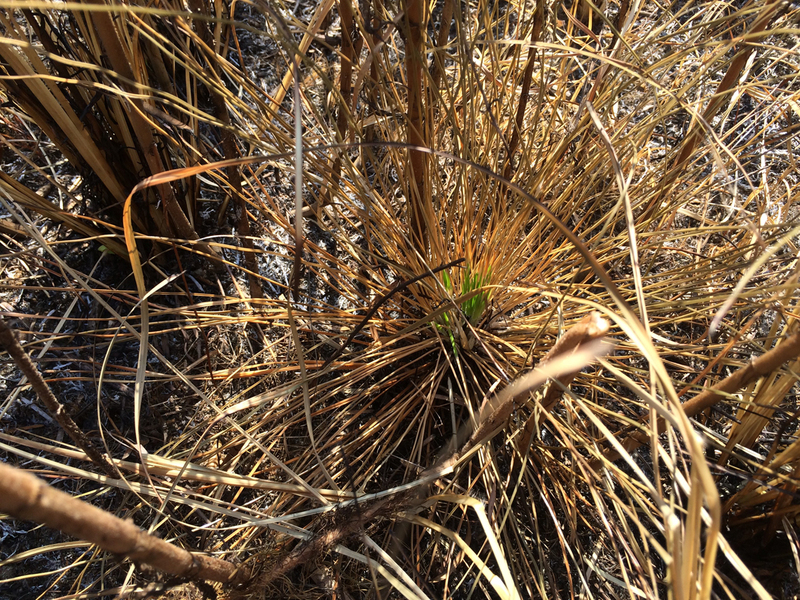 Additionally, after a fire, many plants will germinate and/or produce seeds or fruit desirable to wildlife. 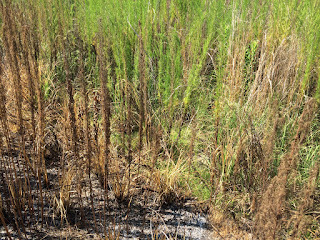 Some areas burned hot enough to consume the grasses and wilt the dog fennel, but left longleaf pines green and unaffected. 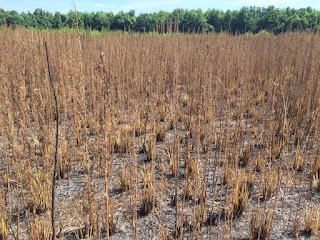 Some areas burned hot enough brown the needles of the longleaf pines. Closer inspection at the needle bases reveals that they are green, having successfully insulated the terminal bud of the tree. 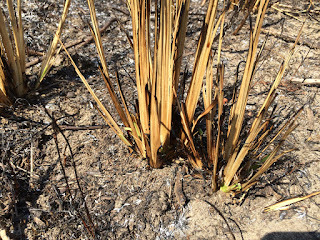 Areas at the boundary of the fire provided a combination of heat, but still exposed the longleaf pine to increased sunlight. 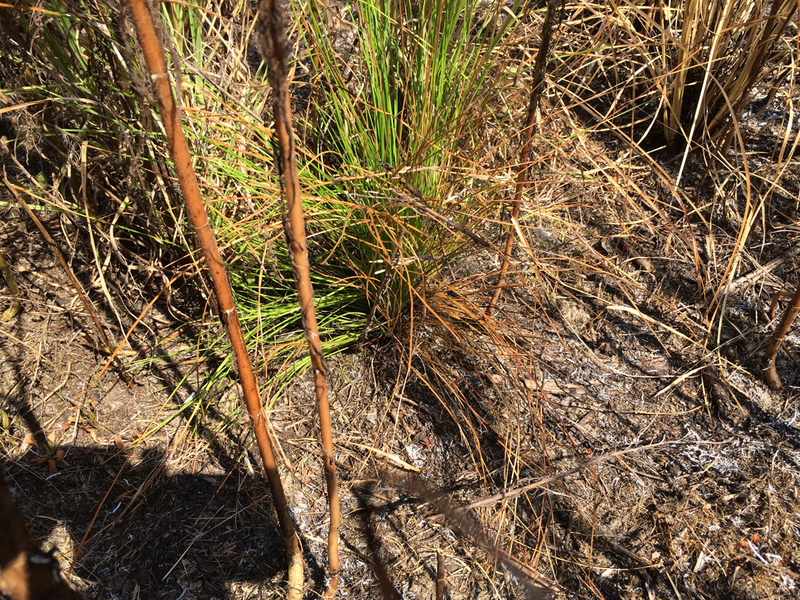 Some areas burned hot enough to consume the longleaf pine needles. 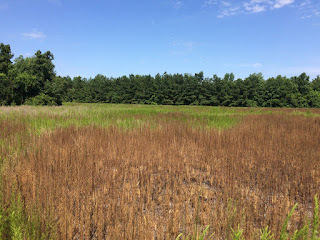 The future of the longleaf pine shown in the image below is uncertain. 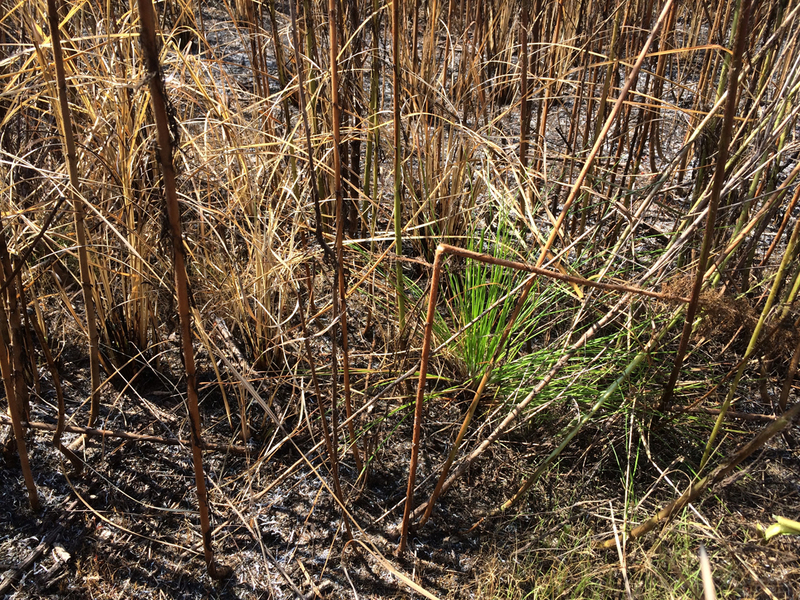 In the grass stage, longleaf pines are close to indestructible. 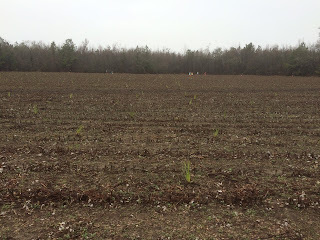 The tap root the longleaf pine has sent into the ground may be sufficient to allow new needles to grow. 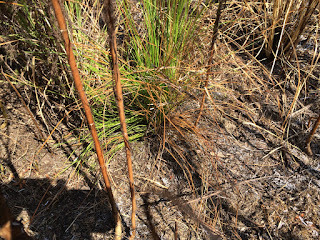 With the neighboring vegetation eliminated, the longleaf pine may thrive in the abundant sunlight and begin rapidly increasing its height above the ground. Conversely, the tree may have been cooked and become part of the anticipated loss within the planted stand. 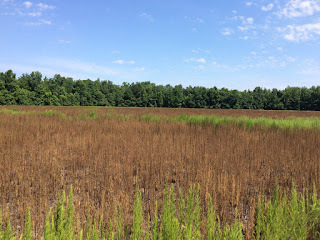 A mature longleaf pine stand has been described as a prairie with some trees. There should be an abundance of space and light between the longleaf pine trees. Therefore, we always plant more trees than we intend to see reach maturity. 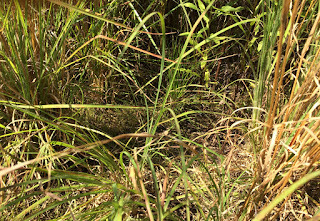 Mortality begins a planting. 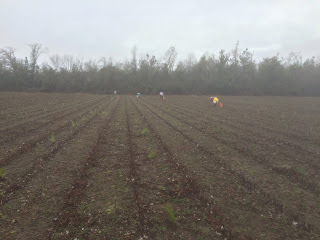 Some seedlings are not physically fit or are improperly placed in the ground. Weather (drought, hurricanes, lightning, ice storms), insects, wild hogs, fire, competing vegetation are but a few of the factors that affect longleaf pine survival. However, more than enough of the well-adapted trees become large enough to elude the previously listed threats and we have to selectively cull less desirable trees (crooked growing, weather damaged, multiple trunks, etc.) to create the open stand we seek. 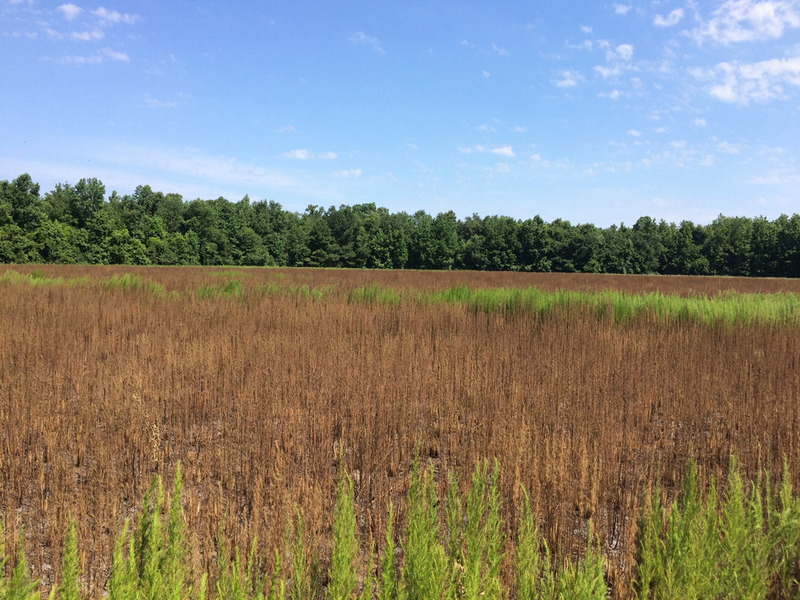 This longleaf pine stand is scheduled to be burned again in fall of 2017. 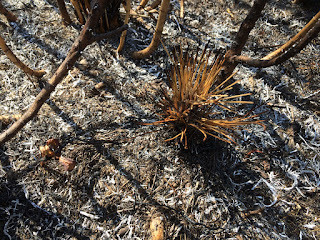 What is certain is that the stand will look different in a year and the fire will be unlike the one we conducted this week.